Gold price forecast, Aug. 29, 2014: Buying gold during the late days of summer has proved to be a winning trade for most of the last two decades, according to Bloomberg. Indeed, September is historically gold's best month. Over the last 20 years, the yellow metal has seen an average gain of 3% in September. 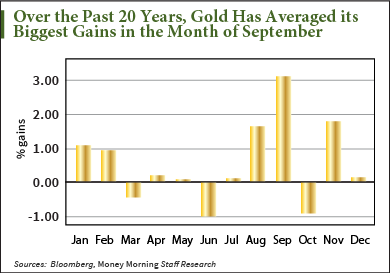 What's more, September's traditional gains have trounced the next best month, November, when the gold price has logged an average 1.8% gain over the last 20 years. Gold buying picks up to a near-frenzied pace in India in late August through October, as the country celebrates the Hindu festival Vinayaka Chaturthi (also known as Ganesh Chaturthi). "Demand is picking up every day," Rahul Gupta, managing director of P.P. Jewellers, a large Indian jewelry chain, told The Wall Street Journal. "Festival season sales have started." Celebrations began Aug. 29, when Indians celebrate the birthday of Lord Ganesh, the god of intellect and wisdom who is identified by his elephant head. Yellow metal sales in India rise during this time because it's deemed good luck to buy gold ornaments for the festivities. During Diwali, the five-day Hindu festival of lights that is celebrated starting Oct. 23, people usually invest in gold coins and bars. The spiritual festival signifies the victory of light over darkness, knowledge over ignorance, good over evil, and hope over despair. Gold jewelry sales tend to enjoy a sharp spike during Diwali – and price gains usually start early. "Indian jewelers and dealers will be stocking up in the coming weeks, so it should affect prices," Mark O'Byrne, a director at brokerage GoldCore Ltd. in Dublin, told Bloomberg. "A lot of traders are aware of this trend towards seasonal strength, so that may contribute to higher prices. They tend to buy and that creates momentum." Next comes the nation's wedding season, when bullion is bought for bridal trousseaus, as well as jewelry, shiny gold bars, and coins to be presented as gifts. One reason festival demand should remain high this year is that the country's monsoon season was not as bad as feared. The majority of India's gold demand comes from rural areas, so the monsoon weighs heavily on purchases.